Very impressive read. I really enjoyed this. A clear conflict between good and evil with baddies aplenty. The Mordent is a great creation, a being born with the memory of other souls gone before him; evil personified. To liven things up, he has competition from other souls, equally prepared to be reborn and in the favour of the Dark Lord. There's also good folk as well, but the Mordent manages to be one step ahead, turning brother against brother as he seeks his minions in the North. Kath is a great creation and has to balance between being a princess and a sword maiden. Nothing is ever simple and her father, the King, pulls some of her strings whilst the Light pulls on others. Overall, very good read. I felt it was better than book 1, The Steel Queen. Not sure this is official. Is it Aragorn with a bow? If so what's he doing in the hobbit? Great artwork nonetheless. Incredible film and a must for fantasy fans. What a gorgeous view and all created by nature. Incredible that a creature can be luminous. I enjoyed this book. It definitely has an appeal and I will be reading book 2. A good read with some excellent characterisation and well crafted plot. This book has a nice feel to it. The heroes develop nicely and there's a multitude of possibilities developing. Very well honed fantasy with a good potential for more to come. Some interesting developments especially over the "enemy" with one individual developing and one being reborn. The scene is set for a conflict between them which should be interesting. Wow, I think so. How can you dispute it?!! Is there a name of a gathering of dragons? Perhaps a murder of dragons? A herd, a gaggle?? Have a look at the original on the link above and blow it up full size. Brilliant. If you like fantasy, magic, demons and the epic battle of good versus evil with an impending sense of doom, then this is the book for you!!! When one of the Eldric makes contact with the demon world, Drachar is immediately banished and stripped from this powers so he will not do this evil deed again. Alas, it goes wrong and Drachar grows ever more powerful and darker. It is then up to the Eldric to fight Drachar and stop him before he goes too far. 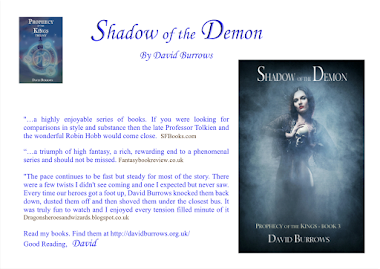 Written with much detail into the vivid world of the Eldric, David Burrows engages the reader into a plot very few have written about and yet the concept is well known, selling your soul to the devil (or in this case demons). 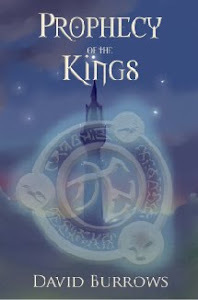 David Burrows brings readers an adventure of epic proportions in The Prophecy of the kings Trilogy. The plot quickly draws the reader into the action of this novel. 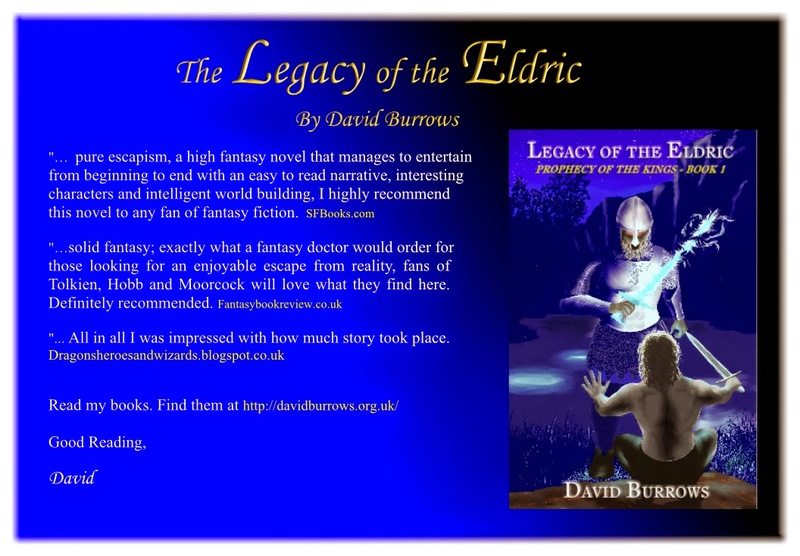 Burrows created a mystical world with equally mystical creatures, dragons, wizards, prophecies, demons, sorcery, and princes. The creatures come to life on the pages of The Prophecy of the Kings. The action in this book keeps readers eagerly turning the pages. 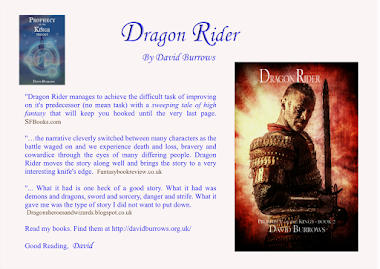 Burrows successfully gave each character a distinct voice. The threads of three worlds are woven together to create an adventure filled with battles, journeys, allies, and enemies. The reader will go deep into the bowels of the earth haunted by the dead. They will accompany Kaplyn into a nightmare tower. 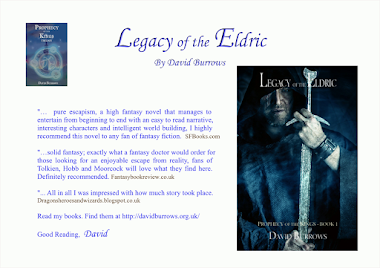 Book 1 Legend of Eldric sets the foundation for this trilogy. Prince Kaplyn is low on the line for the throne, and he is bored. He sets out to find adventure. Lars is bound for death when Kaplyn comes to his rescue. The pair assists a wizard in retrieving a pendant. They set in motion a prophecy that could destroy their world. Burrows words are like magic. He paints a portrait on each page. Fans of fantasy know his name well. They know they can depend on an escape into another world when they read one of his books. Burrows never fails to please. I like the light and shade in this.